The presence of ice on an aircraft may be the result of direct precipitation, formation of frost on integral fuel tanks after prolonged flight at high altitude, or accumulations on the landing gear following taxiing through snow or slush. In accordance with the Federal Aviation Administration (FAA) Advisory Circular (AC) 120-60, the aircraft must be free of all frozen contaminants adhering to the wings, control surfaces, propellers, engine inlets, or other critical surfaces before takeoff. Any deposits of ice, snow, or frost on the external surfaces of an aircraft may drastically affect its performance. 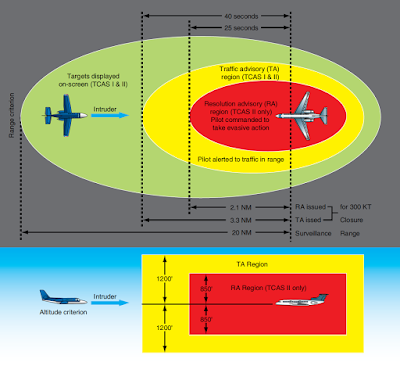 This may be due to reduced aerodynamic lift and increased aerodynamic drag resulting from the disturbed airflow over the airfoil surfaces, or it may be due to the weight of the deposit over the whole aircraft. The operation of an aircraft may also be seriously affected by the freezing of moisture in controls, hinges, valves, microswitches, or by the ingestion of ice into the engine. When aircraft are hangared to melt snow or frost, any melted snow or ice may freeze again if the aircraft is subsequently moved into subzero temperatures. Any measures taken to remove frozen deposits while the aircraft is on the ground must also prevent the possible refreezing of the liquid. Frost deposits can be removed by placing the aircraft in a warm hangar or by using a frost remover or deicing fluid. These fluids normally contain ethylene glycol and isopropyl alcohol and can be applied either by spray or by hand. It should be applied within 2 hours of flight. Deicing fluids may adversely affect windows or the exterior finish of the aircraft, only the type of fluid recommended by the aircraft manufacturer should be used. Transport category aircraft are often deiced on the ramp or a dedicated deicing location on the airport. Deicing trucks are used to spray the deicing and/or anti-icing fluid on aircraft surfaces. The deicing fluid must be accepted according to its type for holdover times, aerodynamic performance, and material compatibility. The coloring of these fluids is also standardized. In general, glycol is colorless, Type-I fluids are orange, Type-II fluids are white/pale yellow, and Type- V fluids are green. The color for Type-III fluid has not yet been determined. When aircraft surfaces are contaminated by frozen moisture, they must be deiced prior to dispatch. 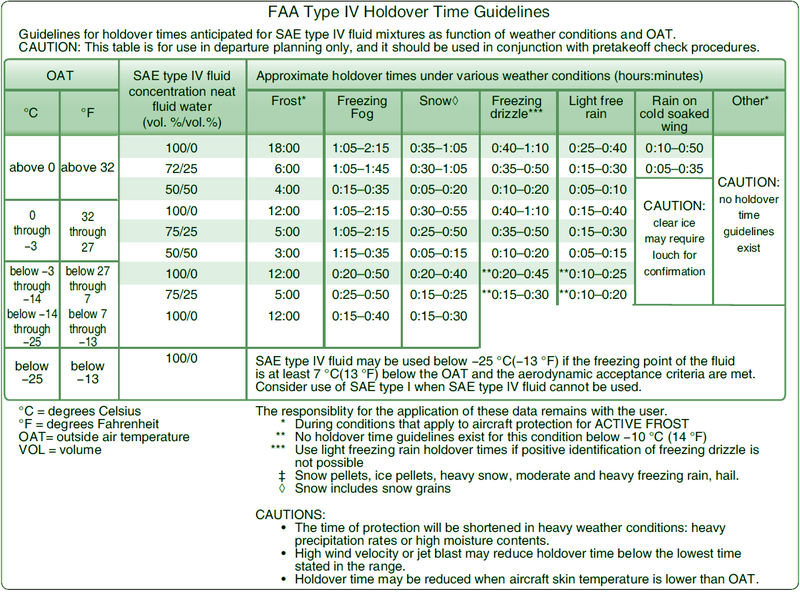 When freezing precipitation exists, and there is a risk of contamination of the surface at the time of dispatch, aircraft surfaces must be anti-iced. If both deicing and anti-icing are required, the procedure may be performed in one or two steps. The selection of a one- or two-step process depends upon weather conditions, available equipment, available fluids, and the holdover time to be achieved. 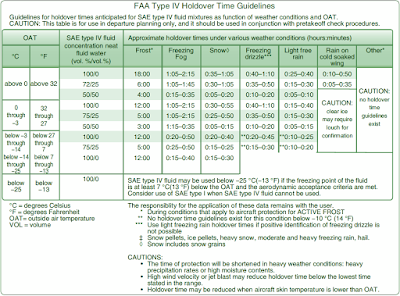 Holdover Time (HOT) is the estimated time that deicing/anti-icing fluid prevents the formation of frost or ice and the accumulation of snow on the critical surfaces of an aircraft. HOT begins when the final application of deicing/anti-icing fluid commences and expires when the deicing/anti-icing fluid loses its effectiveness. Figure 1 shows a holdover timetable for Type IV fluid. Basically, all surfaces that have an aerodynamic, control, sensing, movement, or measuring function must be clean. These surfaces cannot necessarily be cleaned and protected in the same conventional deicing/anti-icing manner as the wings. Some areas require only a cleaning operation, while others need protection against freezing. 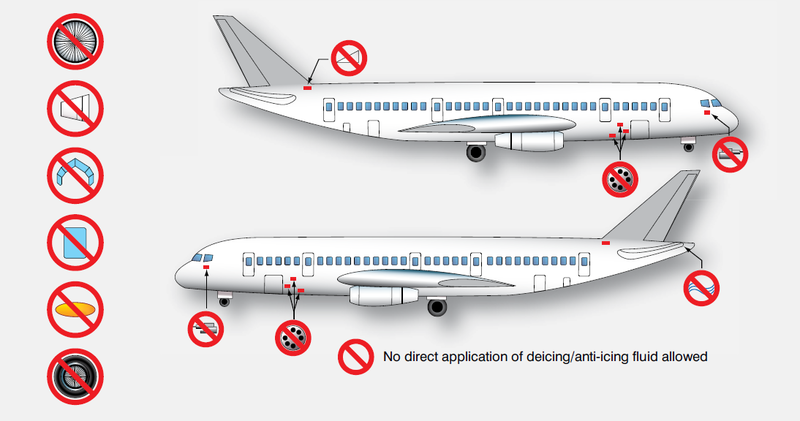 The procedure of deicing may also vary according to aircraft limitations. The use of hot air may be required when deicing (e.g., landing gear or propellers). Deicing/anti-icing fluids must not be sprayed directly on wiring harnesses and electrical components (e.g., receptacles, junction boxes), onto brakes, wheels, exhausts, or thrust reversers. 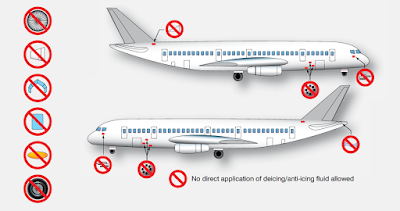 Deicing/anti-icing fluid shall not be directed into the orifices of pitot heads, static ports, or directly onto airstream direction detectors probes/angle of attack airflow sensors. All reasonable precautions shall be taken to minimize fluid entry into engines, other intakes/outlets, and control surface cavities. Fluids shall not be directed onto flight deck or cabin windows as this can cause crazing of acrylics or penetration of the window seals. Any forward area from which fluid can blow back onto windscreens during taxi or subsequent takeoff shall be free of residues prior to departure. If Type II, III, or IV fluids are used, all traces of the fluid on flight deck windows should be removed prior to departure, particular attention being paid to windows fitted with wipers. Landing gear and wheel bays shall be kept free from buildup of slush, ice, or accumulations of blown snow. Probably the most difficult deposit to deal with is deep, wet snow when ambient temperatures are slightly above the freezing point. This type of deposit should be removed with a soft brush or squeegee. Use care to avoid damage to antennas, vents, stall warning devices, vortex generators, etc., that may be concealed by the snow. Light, dry snow in subzero temperatures should be blown off whenever possible; the use of hot air is not recommended, since this would melt the snow, which would then freeze and require further treatment. Moderate or heavy ice and residual snow deposits should be removed with a deicing fluid. No attempt should be made to remove ice deposits or break an ice bond by force. After completion of deicing operations, inspect the aircraft to ensure that its condition is satisfactory for flight. All external surfaces should be examined for signs of residual snow or ice, particularly in the vicinity of control gaps and hinges. Check the drain and pressure sensing ports for obstructions. When it becomes necessary to physically remove a layer of snow, all protrusions and vents should be examined for signs of damage. Control surfaces should be moved to ascertain that they have full and free movement. The landing gear mechanism, doors and bay, and wheel brakes should be inspected for snow or ice deposits and the operation of uplocks and microswitches checked. Snow or ice can enter turbine engine intakes and freeze in the compressor. If the compressor cannot be turned by hand for this reason, hot air should be blown through the engine until the rotating parts are free.